INDION 220 Na is a high capacity strongly acidic cation exchanger in bead form. It is based on cross linked polystyrene and has a gel structure. The resin contains sulphonic acid functional groups. It is supplied moist in the sodium form. INDION 220 Na is used most widely in sodium form for water softening application. It can be used also in two stage de - ionizing as the cation exchanger in the hydrogen cycle. 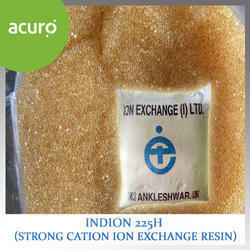 INDION 225 Na is a high capacity strongly acidic cation exchanger in bead form. It is based on cross linked polystyrene and has a gel structure. 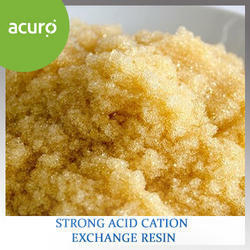 The resin contains sulphonic acid functional groups. It is supplied moist in the sodium form. shade. INDION 225 Na is used most widely in sodium form for water softening application. It can be used also in two-stage de-ionising as the cation exchanger in the hydrogen cycle. 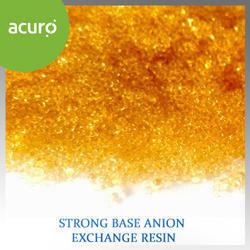 Indion 225 H is a premium grade strong acid cation exchange resin containing sulphonic acid groups. It is based on cross - linked polystyrene and has a gel structure. 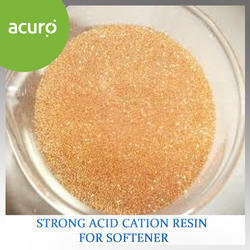 The resin has high capacity and excellent kinetics. Indion 225 H form is used in coflow and counter flow modes as a first stage in demineralising for the removal of cations. Special grades are available for use in mixed bed and condensate polishing units. Appearance Golden yellow to brown beads Matrix Styrene divinylbenzene copolymer Functional Group Sulphonic acid Ionic form as supplied Hydrogen Total exchange capacity 1.8 meq/ml, minimum Moisture holding capacity 49 - 55 % Shipping weight * 780 kg/m , approximately Particle size range 0.3 to 1.2 mm > 1.2 mm 5.0%, maximum < 0.3 mm 1.0%, maximum Uniformity co-efficient. 1.7, maximum Effective size 0.45 to 0.55 mm0 Maximum operating temperature 120 Cooperating pH range 0 to 14 Volume change Na to H, 8% approximately Resistance to reducing agents Good Resistance to oxidizing agents : Generally good, chlorine should be absent. INDION FFIP is a Type 1 strong base, unifunctional anion exchange resin in bead form, containing trimethyl benzyl ammonium groups. It is based on cross-linked polystyrene and has an isoporous structure. INDION FFIP has a very high basicity. It is effective in removing weak acids such as silica and carbon dioxide and recommended in two stage/multiple stage or mixed bed de-ionising, where high quality de-ionized water and lowest silica residuals are desired. In addition INDION FFIP demonstrates stability to high temperature regeneration required for minimum silica leakage. It has a high reversible capacity for the natural organic matter present in some surface waters, with excellent resistance to fouling by this organic matter. It is used for various steps of de-ionising like two stage de-ionising, multiple stage de-ionising and mixed bed de-ionising. 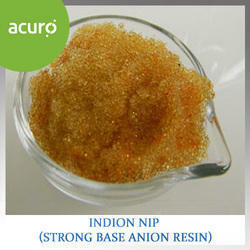 Indion NIP is a Type 2 strong base anion exchange resin in bead form having dimethyl-ethanol-ammonium groups. These groups are less strongly basic than those in Type 1 resins, resulting in a higher regeneration efficiency with lower operating costs. Indion NIP is based on cross-linked polystyene and has an isoporous structure. Indion NIP has a high capacity for the antural organic matter present in some surface waters and has excellent resistance to poisoning by this organic matter. Resistance to oxidizing agents Generally good, chlorine should be absent.